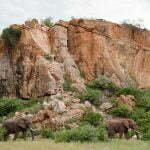 Mapungubwe National Park and World Heritage Site is the ideal location for anyone interested in the park’s wildlife and birds, to those in search of serenity, identity and the extraordinary history of this World Heritage Site… Come and join these diverse pilgrims and share unforgettable moments sipping sun-downers at the confluence of the legendary Limpopo and Shashe Rivers, watch the eagles soar over Botswana and Zimbabwe’s skies, hear the echo of elephant trumpets, take a tree top walk or just relax and absorb the surroundings… Mapungubwe National Park and World Heritage Site is rich in biodiversity, great scenic beauty and the cultural importance of the archaeological treasures of Mapungubwe. 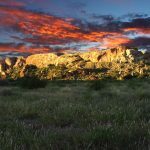 Areas of Special Interest The Lost City: Visit Mapungubwe Hill, where a far developed African civilization prospered between 1200 and 1270 AD. The area was already inhabited by a growing Iron Age community from 900 AD and became rich through trade with faraway places like Egypt, India and China. This is the place where archaeologists excavated the famous golden rhino and other evidence of a wealthy African kingdom. 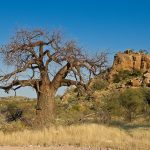 About the time of the Dark Ages of Europe, the royal court at Mapungubwe in Limpopo welcomed traders and men of influence from Arabia and the Far East. Only in recent decades have the fascinating details of this ancient city been uncovered.Archaeologists at the University of Pretoria are slowly piece together the story of Mapungubwe. They found human skeletons lying in seated or foetal positions, often with artifacts like beads, ivory, animal bones and pots. Burials on the hill were obviously those of royalty, and vast quantities of gold were found with their remains. The beads found at Mapungubwe ‘are thought to originate from India, Egypt, Southeast Asia and the Middle East’, says Sian Tiley, author of Mapungubwe – South Africa’s Crown Jewels. It was a commercial network that would make today’s globalised traders envious. 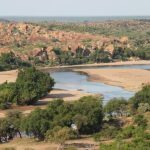 Wildlife and Mystic Scenery: Sandstone formations, Mopane woodlands and unique riverine forest and baobab trees form the astounding scenic backdrop for a rich variety of animal life. Elephant, giraffe, white rhino, eland, Gemsbok and numerous other antelope species occur naturally in the area. Lucky visitors might spot predators like lions, leopards and hyenas. Birders can tick off 400 species, including kori bustard, tropical boubou and pel’s fishing owl.